There is exactly one week left to the beginning of the Simple Living Challenge on the Kanelstrand blog and there couldn't be better timing for today's giveaway. It is sponsored by Taryn and Jeff Wilson of Mystic Orb. I have a confession to make. I think I am in love with these guys, just drop by and read their blogs, yes, they have two: Mystic Orb and Wooly Moss Roots. You will find so much simple, heartfelt inspiration that you will wonder where they have been hiding so far. Where? In the forest, of course! Spring brings nettles, fuzzy little chicks, singing frogs, and planting seeds. Summer brings garden bounty, berry picking, clothes on the line, flowers in bloom, open windows and bonfires at night. Fall brings food preserving, celebrating harvest, gathering firewood, apple pressing parties, and baskets of huckleberries and chantrelles. Winter brings fires in the woodstove, savory soups, books full of adventure, a slower pace, quiet contemplation and warm cups of tea! You can feel their connection to nature when you see their mind-blowing wood carvings. These people love wood! Take a look yourselves, jump to the Mystic Orb shop and the Wooly Moss Roots shop. You will find intricately carved pendants, earrings, home accessories and wooden buttons in so many types of wood and with so many patterns that you will want to have them all. At least I do and I am not in the least surprised to learn that their motto is FEED THE JOY. But what makes me like the Wilson family even more is that they like to give and when they do, they do it from their hearts. This week's giveaway prizes are worth $87! A gorgeous pendant carved in reclaimed birdseye maple burl wood, worth $45. 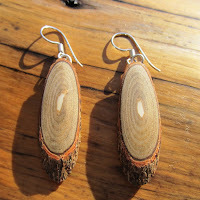 Stylish eco earrings made out of reclaimed sassafras wood, worth $12. 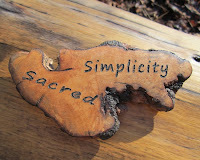 A unique magnet with a reminder that simplicity is sacred, carved in huckleberry root burl wood, worth $30. In the meantime, while you are filling out the rafflecopter widget, bear in mind that both Wilsons' shops will be offering a generous 15% discount for the week of the giveaway. Use coupon code KANELSTRAND15 at checkout and choose a gift made with love! You only have time until February 1st, when the discount will expire. The giveaway ends on Wednesday, February 1st 2012 and is open Worldwide. You will not be eligible to win if you only fill out one of the two mandatory entries. The Inlay Necklace is beautiful. And I like the ebony buttons too. I love the red cedar earrings....so simple but beautiful! tree necklace is my favorite! I adore those earrings. They're beautiful. I just love the Wood Container- in Reclaimed Ironwood- Wooden Box. So beautiful. I want to live with them!! Everything is beautiful, but I particularly love the magnets and lightswitch plates! Thanks again, Sonya for introducing us to more amazing people!! Love the pendant! amazing details! What a lovely and unique giveaway ~ wonderful! :) I'll have to check out those blogs too! My favorite item from their shop is that stunning tree necklace in yew, with beads. Just beautiful! Their tree necklaces seem so honest and good. Thanks for the giveaway! It's fun just to say 'sassafras' but it would be better to wear those earrings! My fav is the Malachite Tree Necklace- Carved Wooden Necklace in reclaimed Mountain Mahogany!! I LOVE your beautiful wearable tree art!! 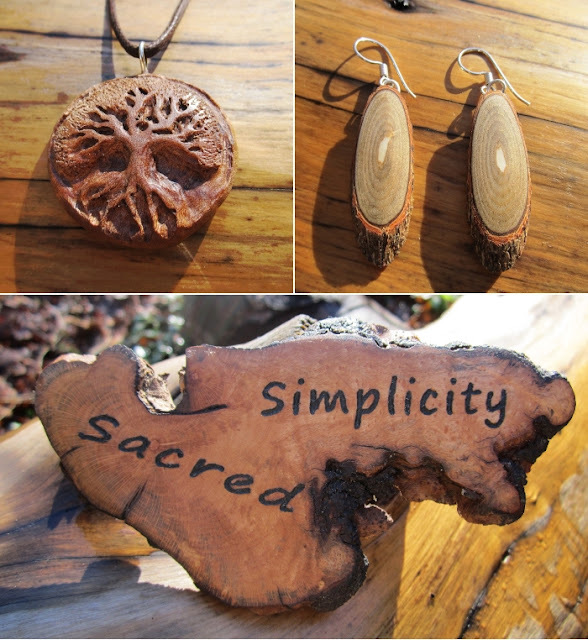 My favorite is the Tree Necklace- Tree Wood Pendant carved in reclaimed Birdseye Maple Burl Wood. My favorite item is the small wooden earrings! so pretty! I like the blackwood earrings and buttons the most. love love love the Wood Lightswitch Plate Cover- Carved in reclaimed Myrtle http://www.etsy.com/listing/80494715/wood-lightswitch-plate-cover-carved-in ! GORGEOUS! I really like the Wood Magnet- Home is where the heart is- Carving. I have been drooling over their work for a very long time. True artists they are! I love everything in the shop. But I think my favorite today is the magnetic wood stash container. It's really hard to chose. I love their whole shop but my favourite item is the wood and necklace Tribal Flow. beautyful stuff. I love their buttons. and the rounded earrings. thanks! My favorite item is the wooden earrings! I love the pendant, it is to die for !!! 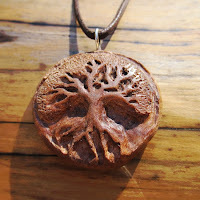 I really love the wooden tree necklace pendants. I also like the wooden buttons. I think the Scrimshaw Necklace- She Loved Trees is beautiful! My fav item from your shop is the Indian Paintrock stone in Myrtle Root Burl Wood! Gorgeous! I love the Tree Wood Pendant carved in reclaimed Birdseye Maple Burl Wood! I can't decide if I like the pendant or the earrings better! They are both so simple but so beautiful - plus a little eco style never hurt anybody! I like the personalized wedding magnate. I love the wooden abalone necklace! I am so in love with the Scrimshaw Necklace - She Loved Trees! Everything is absolutely gorgeous, but that necklace is going on my birthday wishlist! Thanks for the opportunity! I love all of your creations and it was difficult for me to choose one item; however the Tree of Life Carved Wooden Necklace in Reclaimed Mountain Mahogany has captured my heart. The eternity knot is a reminder that we need to be rooted in love, with creation and the people around us. Thank you for hosting this giveaway. I like the HOT magnet..
WHAT AN AWESOME GIVEAWAY!!!!! GREAT IDEAS OF GIFTS, I WOULD'VE NEVER THOUGHT OF!!!! GREAT ARTISTRY WORK & ALL NATURAL!!!!!! THANKS FOR THE GIVEAWAY...I AM EXCITED!!!!!! The Wizards Dream Pipe for my husbands collection!